Nanotechnology is revolutionizing the chemical, telecom, biotech, pharmaceutical, health care, aerospace, and computer industries, among others, and many exciting new nanotech applications are envisioned for the near future. While the rapid pace of innovation has been truly inspiring, much remains to be learned about the potential environmental and health risks posed by this nascent technology and its byproducts. So important is this issue that the ultimate success or failure of nanotechnology may well depend on how effectively science and industry address these concerns in the years ahead. 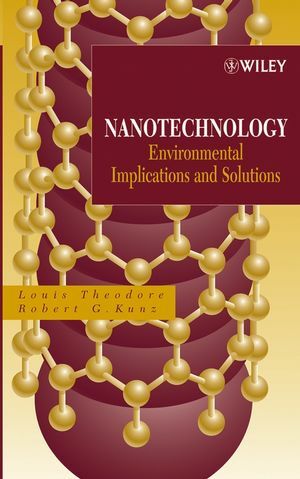 * The future of nanotechnology and the "Industrial Revolution II"
Assuming only a basic knowledge of physics, chemistry, and mathematics on behalf of its readers, Nanotechnology: Environmental Implications and Solutions makes fascinating and useful reading for engineers, scientists, administrators, environmental regulatory officials, and public policy makers, as well as students in a range of science and engineering disciplines. LOUIS THEODORE, PhD, is Professor in the Chemical Engineering Department of Manhattan College, in New York City. He has received awards from the International Air and Waste Management Association and the American Society for Engineering Education. ROBERT G. KUNZ, PhD, is an environmental consultant with three decades of experience in the petroleum and chemical industries. He is the recipient of the Water Pollution Control Federation's Harrison Prescott Eddy Medal. 1.2 Survey of Nanotechnology Applications. 1.3 Legal Considerations for Nanotechnology by A. Calderone. 1.7 Classification and Sources of Pollutants. 2 NANOTECHNOLOGY: TURNING BASIC SCIENCE INTO REALITY (Suzanne A. Shelley). 2.2 Basic Chemistry and Size-Related Properties. 2.3 Nanotechnology: Prime Materials and Manufacturing Methods. 2.4 Carbon Nanotubes and Buckyballs. 2.5 Current and Future Market Applications. 2.7 Health and Safety Issues: Ethical, Legal, and Societal Implications. 2.8 Funding Future Developmental Efforts. 3.2 Air Pollution Control Equipment. 4.4 Dispersion Modeling in Water Systems. 5.3 Municipal Solid Waste Management. 6.3 Multimedia Application: A Chemical Plant. 6.4 Multimedia Application: Products and Services. 6.5 Multimedia Application: A Hazardous Waste Incineration Facility. 7.2 Health Risk Assessment Evaluation Process. 7.3 Why Use Risk-Based Decision Making? 7.4 Risk-Based Corrective Action Approach. 7.5 Statutory Requirements Involving Environmental Communication. 7.6 Public Perception of Risk. 7.8 Seven Cardinal Rules of Risk Communication. 8.2 Superfund Amendments and Reauthorization of Act of 1986. 8.3 Need For Emergency Response Planning. 8.7 Hazard Risk Assessment Evaluation Process. 10.5 Multimedia Concerns and Hazards. 10.6 Health and Hazard Risk Assessment.